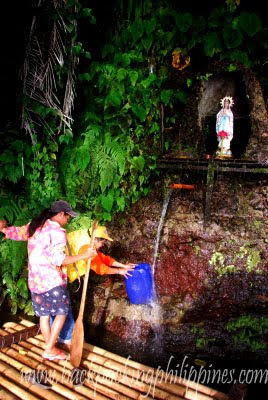 Tutubi visited The City of Seven Lakes that is San Pablo in Laguna twice but on both occasions he was not able to to do a sidetrip to the still pristine lake due to, first, usual busy Tutubi, and, second, sudden rain spoiled the day. On the third take, he was able to finish work early and while waiting for his peers to to finish theirs, "sneaked" out to tour the cleanest and greenest of San Pablo City's Seven Lakes: Pandin Lake. After about 15 minutes on Schetellig Avenue from San Pablo Cathedral, Tutubi saw the Lake Pandin sign on the left side of the road (just near another sign of Lake lanot), he stopped to park his car at the "parking lot" then asked around for Mang Tano, the leader of the caretakers of the lake. Another 10 minutes of slow trekking, Tutubi spotted Lake Pandin before descending to the lake shore. He was greeted by a large group of tourists going home with smiles on their faces and even told him it's going to be dark soon but he didn't mind. Several bamboo rafts with huts and benches were waiting for passengers. 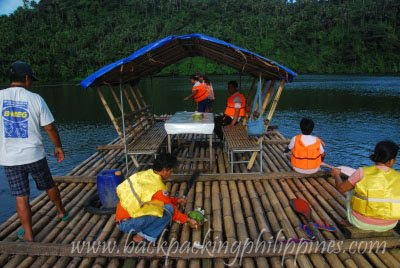 When he inquired how much was the cost to board the rafts and tour the lake, he got P180/person (even if you're alone or with a group) which takes about 3 to four hours that includes. He begged off from the long tour due to limited time and just opted for the one hour crossing the lake on the bamboo rafts guided by a rope to the other side of the lake where a grotto and spring water was fetched before going back. 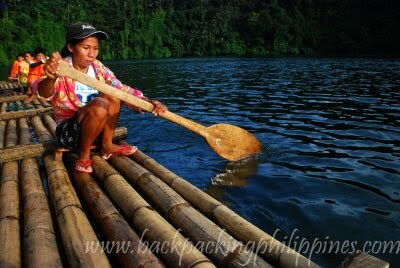 The ones steering the raft were women, call them the oarswomen of Lake Pandin, while the barangay captain joined the fun. They were mostly game with joking around and telling stories and legend of the origins of the seven lakes of San Pablo to the joking Tutubi. 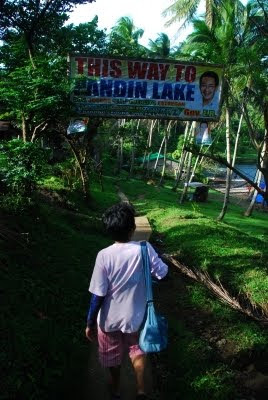 Once back to the "docking" area of the lake, the women suggested a tour of Lake Yambo, Pandin's twin lake via a small water link between the two and is inclusive of the P180 Lake Pandin tour price but he declined due to his very limited time. Complimentary buco juice was served and enjoyed "lips-to-lips" style due to the absence of straw (it's really better since plastic straw may just end up polluting the lake). After the abbreviated "green water" rafting tour, he went back to the city center, near CARD Bank on Quezon St., only to find out his peers still were not ready to go home. What Tutubi did next to while away time? A tour of Sampaloc Lake! Safety: mandatory wearing of life vests. rafts don't tip over and will only slightly submerge if overloaded but not completely sink unless the bamboo poles are unbound. Commuting from San Pablo City center near San Pablo Cathedral, ride a jeepney with signboard "Ilog" or those plying the San Pablo - Nagcarlan -Liliw route and request the driver to drop you off at the Pandin Lake sign along the road of barangay Sto. Angel. There's another five minutes or so walk to Pandin lake shore. If you're from Laguna, you can ride the jeepney to the capital town of Sta. Cruz and transfer to a jeepney going to San Pablo City. Driving directions: from San Pablo city center Schettelig Avenue all the way to barangay Sto. Angel. You may park your vehicle near the Lake Pandin sign (you can see this to your left) with approximate travel time of twenty minutes. They have someone to watch your car while you're away and the guide will fetch you from the parking space. i wonder why the guvnor's face is on the banner? happy new year. hope this year is brighter for you and your family. photo cache, it's the usual thing here to put faces of politicians almost everywhere. yeah, sidetrips...i mostly travel mostly for sidetrips. 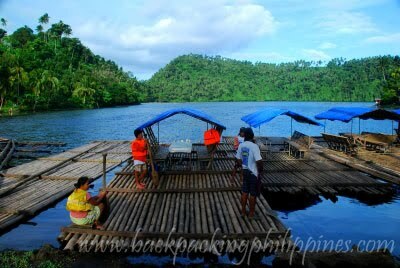 this lake pandin tour is an alternative or compliments pagsanjan falls tour, about an hour away. what a beautiful lake. now that and the seven lakes are something else to look forward to on a future visit to laguna. all i've ever visited are the hot springs, uplb and mt. makiling. WOW...im so excited, and two more days, it will be weekend. Me and my buddies the xplorerboyz will visit all of those seven lakes....yahoo...thanks for the information. Hope everyone had fun visiting our lovely city. Please do come back and bring your friends over. We're planning to visit San Pablo on 13.08.2011. Can you suggest us a good itimerary? is it safe in their?? wala bang loko2x?? Going there in a couple of days! Can't wait given your successful visit. Was trying to track down prices hoping not to get ripped off. PhP 180 sounds reasonable for a 2-3 hour tour around two lakes! Pero mahal daw ang buko, you didn't mention how much you paid. Galing!! Loboc River ng Luzon.. Galing!! 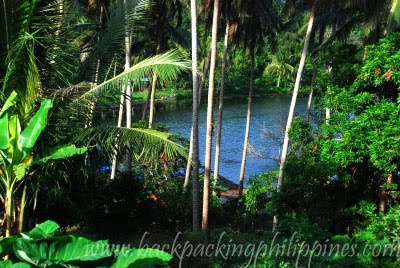 Loboc River Luzon version..